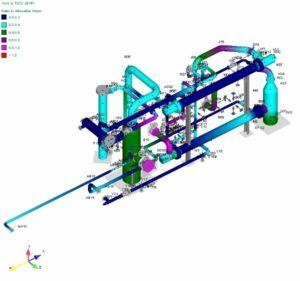 Pressure Worx can assist you with pipe stress analysis and FEA modelling for both new and existing installations. We are experienced users of Bentley AutoPipe. AutoPIPE enables users to create, modify, and review piping and structural models and their results quickly and easily while offering advanced linear and non-linear analysis capabilities under static and dynamic conditions like temperature, wind, wave, buoyancy, snow, seismic, and transient loadings. If you require any of these services, please contact us to discuss your requirements.